If you’re new to memory foam mattresses and you’ve been having a look through some of the reviews I have for you on my website, I can forgive you for not quite understanding what different types there are and what benefits they offer. Since I’m all about making sure you find the right mattress for you (and at the right price), I thought it would be a good idea to add some short and to the point information about the types of memory foam you will come across. So, let’s start with the best known. This type first started to take hold of the market in the mid 1990’s and for good reason. Unlike a spring mattress, traditional memory foam has been designed so your body is cradled while you sleep. What this does is helps to increase blood circulation and reduces the amount of stress you get on various joints across the body while you sleep. Motion transfer is something else to think about. If you sleep next to someone who is constantly tossing and turning (or indeed, if you are that person), traditional memory foam will stop this from happening. Lastly, a traditional memory foam mattress will last much longer than a spring type because of the materials used and the way it’s constructed. One of the biggest complaints about memory foam mattresses is the amount of heat they can produce. This is because lots of models have been designed so they react to your body temperature. When this happens, the material softens which is why you get such great support from them. In fact, you could say it’s a little like sleeping on air. 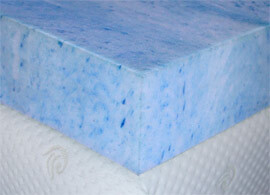 Manufacturers have listened to their customers, and you can now buy air cool memory foam. If you opt for a mattress that includes this technology, it will respond to your body temperature much quicker and will channel the warmth out. This eliminates the issue with additional heat and makes for a cooler night’s sleep. 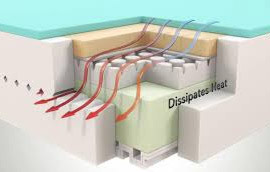 Some models also use what’s called open cell technology which helps to distribute heat more evenly. The 12″ LUCID® by Linenspa I have reviewed here is a perfect example of this type of technology. If you’re interested in seeing an example of this, take a look at my review on the Ultimate Dreams 13″ Gel Memory Foam Mattress.